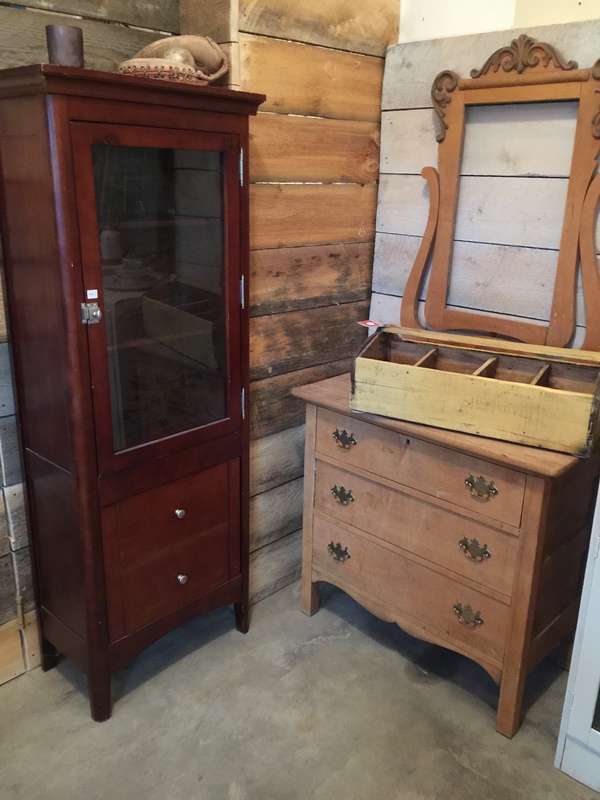 I had purchased a set of two apothecary style cabinets back in May. One I had made over with FAT paint and early 18th century tin that I had found at an architectural salvage yard. I ended up selling it before I could take proper pictures of it but here is a peek at what it looked like. To be honest … I have seller’s remorse over it. The tin on it was amazing and had that perfectly rusty patina with original chippy paint on it. I think the rust complimented the green colour and well… it was just plain cool! This is how it looked before. It looks great on the photos but in reality it had many scratches and the glass was cracked. Now after that one had sold I decided to to make the other one using tin as well but in a different colour. I no longer had that pattern of tin but I had some of the same vintage I could use. 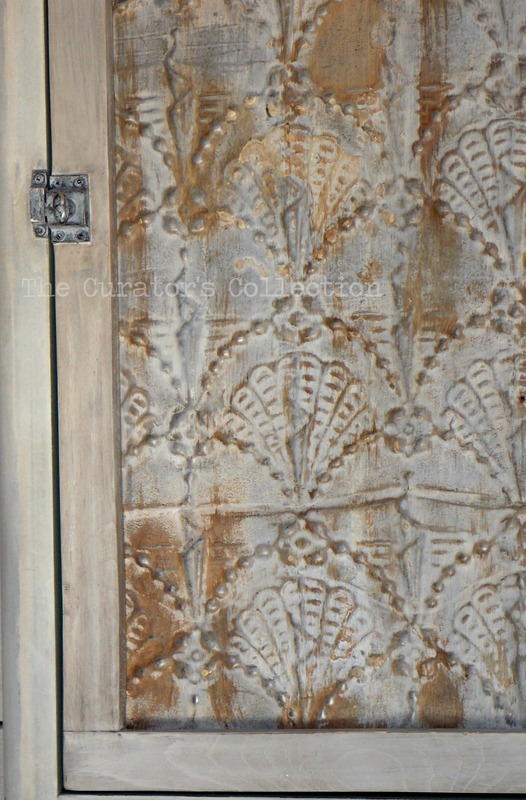 This tin wasn’t as unique as the other cabinet but it too had rusty pretty patina on it. I did end up sanding it smooth just to help clean it up some. 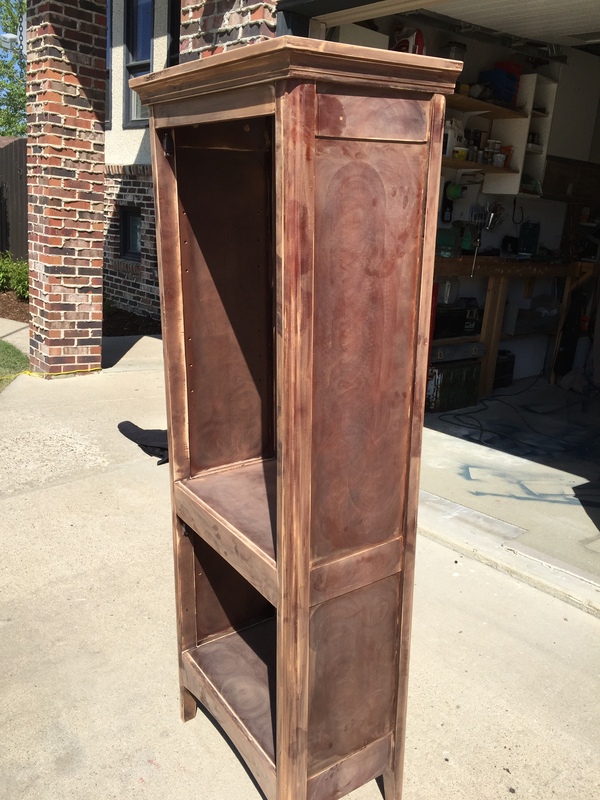 On this cabinet I had to create the door that holds the tin as I broke the original when I was sanding it to prep it for paint. I think it turned out pretty good in the end. 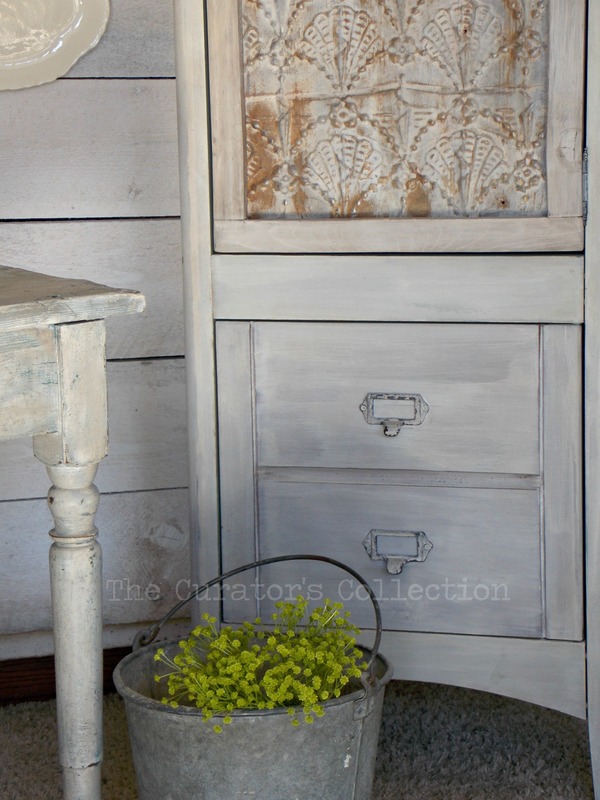 The exterior of the cabinet was painted in Miss Mustard Seed’s Milk paint in the colour Grainsack followed by a light sanding and coat of clear wax. I then went over it lightly with a touch of dark wax to “dirty” it up a little and help it to match the age of the tin. I also added new hardware to the lower cabinet door. No, those aren’t drawers below it is just a cabinet door. The inside of the cabinet is set up for adjustable shelving and I thought a pop of colour on the inside may be a nice touch to an already unique little piece. I painted the inside using FAT paint in the colour Verdigris followed by a coat of clear wax. I absolutely love this colour! 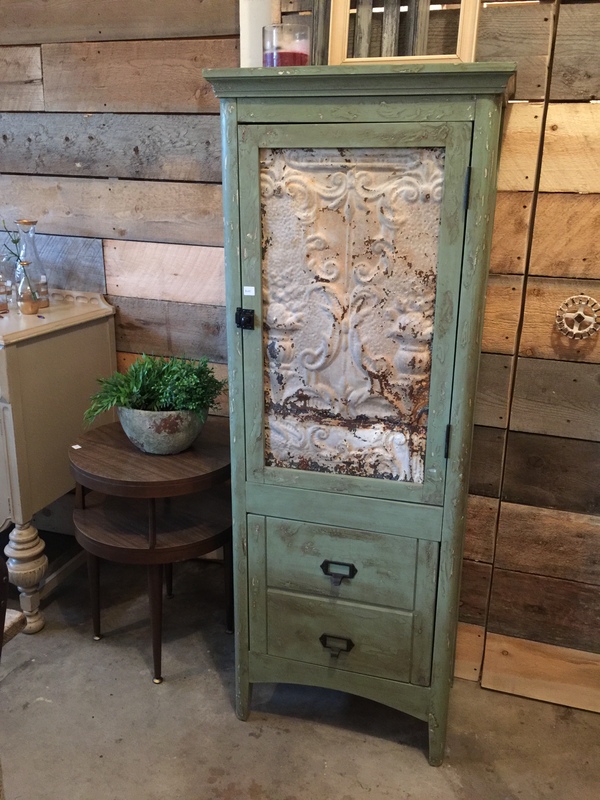 How sweet is this little cabinet? I have it displayed with a few dishes in it but really it could be used anywhere. Imagine it in a bathroom with towels and extra TP or other toiletries in it. It would also sit nicely in a front entryway and house baskets of mittens or scarves. It is the perfect sized piece for small spaces because of it’s low profile. Both cabinets turned out awesome and it’s amazing what a change of colour can do to the same piece. I absolutely love it! Adding the tin really makes this piece unique. What a great transformation, Terry. Thank you so much Mary! I am in love with rusty old tin. There are so many ways to use it! I hope you have an amazing day! Did you say the cabinet is gone? 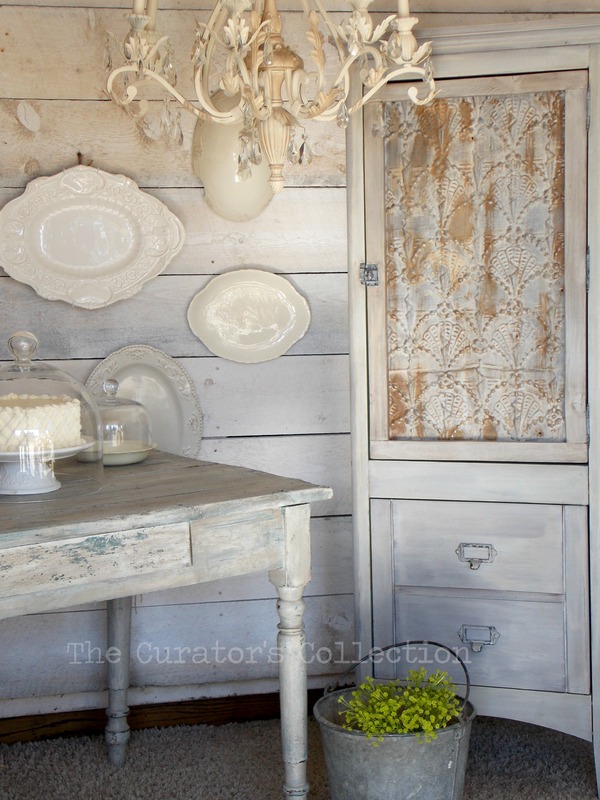 I was commenting about your Apothecary Redo…not sure if i commented in the right place! Haha! Sorry if I messed that up! Love that Verdigris color, so pretty! oooooo! I like that “furniture whisperer” ! You are sweet! I hope you have a great weekend! Oh how lovely is this, Terry! The inside is as pretty as the exterior! 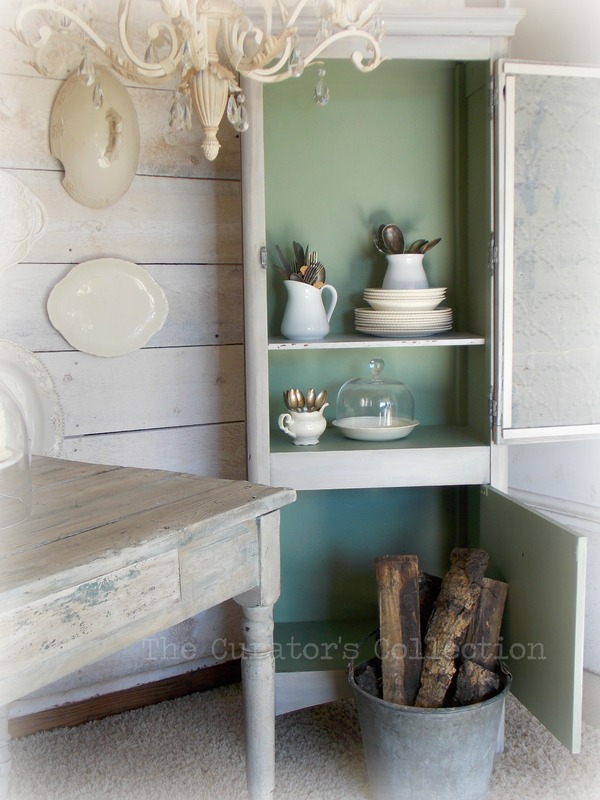 Swooning over the tin and how you turned the cupboard door into an apothecary style look. Very nice and I have no doubt that it will sell at the market. Thank you Marie! I hope you do well at your market this weekend! Another beautiful makeover Terry! I loove the tin!! 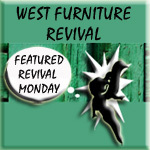 I recently found a salvage yard near Ottawa and have been finding some amazing wood there. I will have to check it out for tin next time I am there. Have a lovely week. I Looooooove salvage yards! I hope you find something great when you go! I hope you have a great weekend! The cabinet is so lovely. I love the addition of the tin and the coordinating color on the inside. Thank you so much! 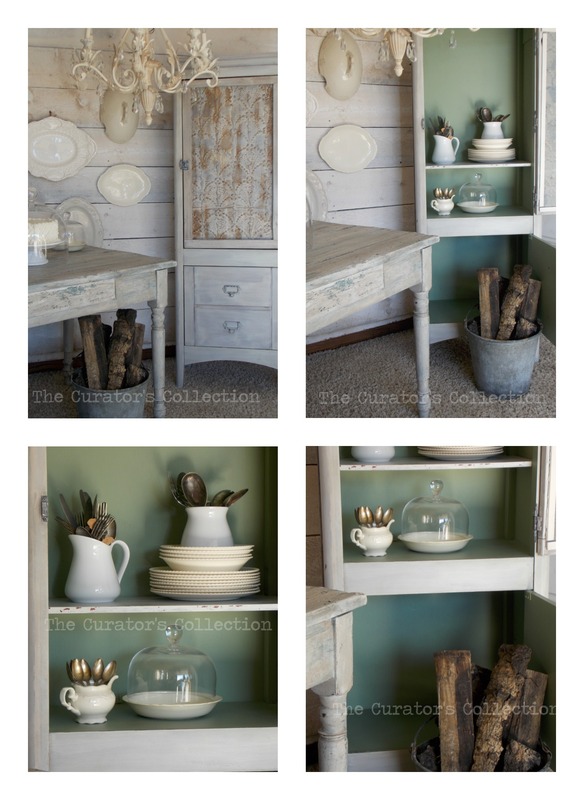 It really is a versatile sweet little cabinet! Have a great day! Oh Terry! I love it! The rusted vintage tin is to die for. The colors you chose are perfect. I love it alll! This is very unique and heartfelt. Your design is soft & collectible. Lovely! Thank you so much for the sweet compliment Judy, so sorry for the late reply! I’m trying to catch up lately ;). I hope you have an amazing day! Thank you so much for your high compliment, it really means a lot! I hope you have an amazing holiday season! How on earth are you getting better and better when you were already genius?? 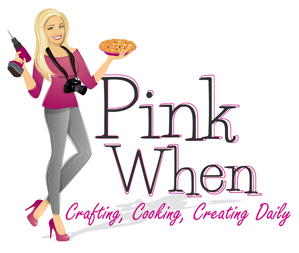 Seriously… is my husband paying you? Ha ha! I will now wear the biggest grin on my face for the rest of the year because I’ma “genius” lol! Thank you!